Ever dreamed of being a daring explorer? Hunting for long lost treasures in jungles around the world? Then this is the game for you! 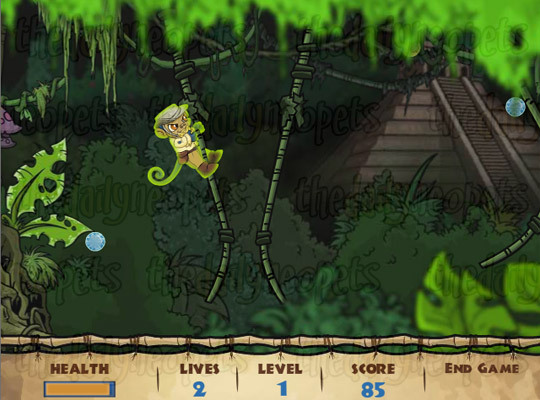 In Jungle Raiders, you play as an intrepid Mynci explorer - swinging from vines and searching the forests of Neopia for ancient artifacts. The controls for this game are very simple. Use the left and right arrow keys to move left and right respectively, and walk along the platforms in the trees. When you come to the vines, wait until they've swung in your direction, then use the space bar to jump on! It might take you a while to get used to jumping from vine to vine - the vine you are currently holding on to slows down while you're on it, so if you don't think you can make a jump just keep holding on until the next vine's faster swing brings it near enough to you :) There is no time limit for this game, so waiting til its safer to jump is advisable! In this game, the main objective is to get to the end of each level. 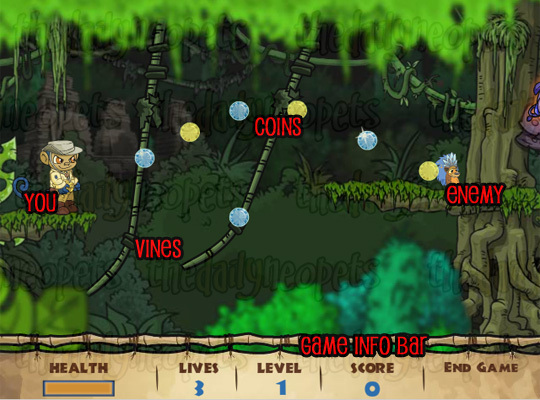 You'll also find silver and gold coins scattered throughout the jungle, which give extra points. Watch out for enemies as you explore too! For the ones that are on the platforms, like in the screenshot above, you can jump onto them and they'll fall off :) You will also encounter snakes on the vines sometimes too, and for those you need to slide down the vine with the down arrow key to knock them off. The final type of enemy you might encounter are cheeky little critters who throw stuff at you from off-screen. Unfortunately, all you can do about these ones is try to avoid the projectiles they throw. As you progress through the game, you'll also find certain power-ups which you can collect for extra abilities. This Anti-Gravity berry will make you light as air, so you can float from vine to vine without worrying about falling off! Another berry, the Speed Up power-up will allow you to move at super speed for a while. This is particularly useful for hurrying along vines since you can jump further when you're sped up. The Health berry will replenish some of the Heath you might have lost when dealing with your enemies. Probably the best power-up, the Extra Life grants you another life in case you accidentally lose your others ones. Another nifty berry, this one will make you Invincible. Perfect for navigating areas where there are a lot of nasty enemies throwing stuff at you! Finally, remember to watch the "Health" in the Game Info Bar. This goes down as you hit enemies and otherwise injure yourself. If it empties completely, you will lose a life. The other stuff in the Game Info should be fairly self-explanatory! Of course, that isn't always possible without waiting forever for the vines to line up - so if you can judge it okay, you can also jump when the vine you are on is at the furthest part of its swing and the other one is moving back towards you. That way, it will keep getting closer as you jump onto it! There aren't really any other "tricks" to this game. Its just practice, practice, practice! Overall, this game can be quite challenging at first - but once you master it, a trophy shouldn't be too far out of your reach :) Good luck exploring the jungles of Neopia! The Snowager is awake. He'll be sleeping in 6 hours, 17 minutes.